Caudalie is a brand that if you haven't tried, then you should. Their story starts back in a French Vineyard in 1995 with Mathilde and Bertrand Thomas, a husband and wife. They believe the grapevine and grapes contain exceptional powers for the skin and they use the best ingredients to develop beauty products that are not only effective but also natural and luxurious. Over time I have used a lot of Caudalie products and absolutely adore the Divine Oil, a product most people seem familiar with because it is a great multi-use oil. 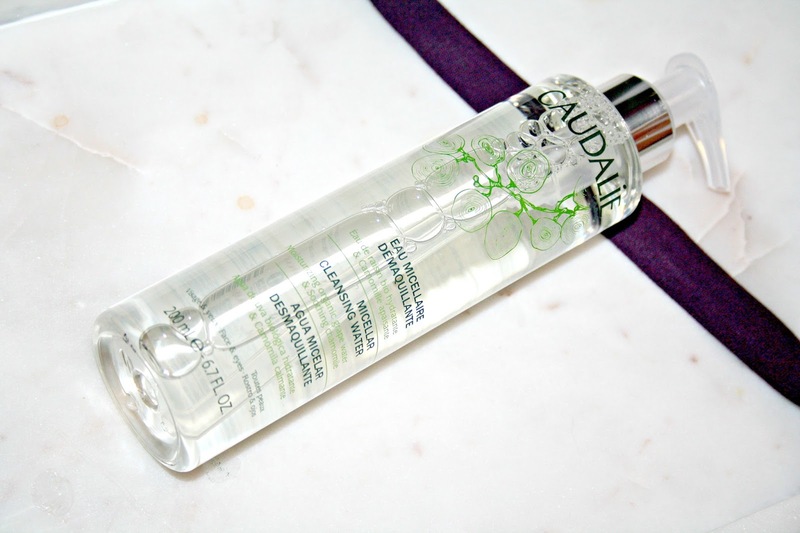 Caudalie Micellar Cleansing Water - Described as being a bit of a cult product for Caudalie, this Cleansing Water is amazing at breaking down and removing the most stubborn of waterproof mascara (Benefit They're Real for example) without the need to over rub the eyes. Having been specially formulated with sensitive skin in mind, I love how incredibly well this micellar water effectively removes all traces of make-up and grime and it does so without leaving your skin feeling dry and taut after using. It does contain the signature grape extracts that you will find present in all of Caudalies products and it so it smells lovely when using. I have absolutely no complaints about using this Micellar Cleansing Water and as someone who in general hasn't been a fan of such products until very recently, this one definitely gets the thumbs up from me and it costs just £14 for 200ml. 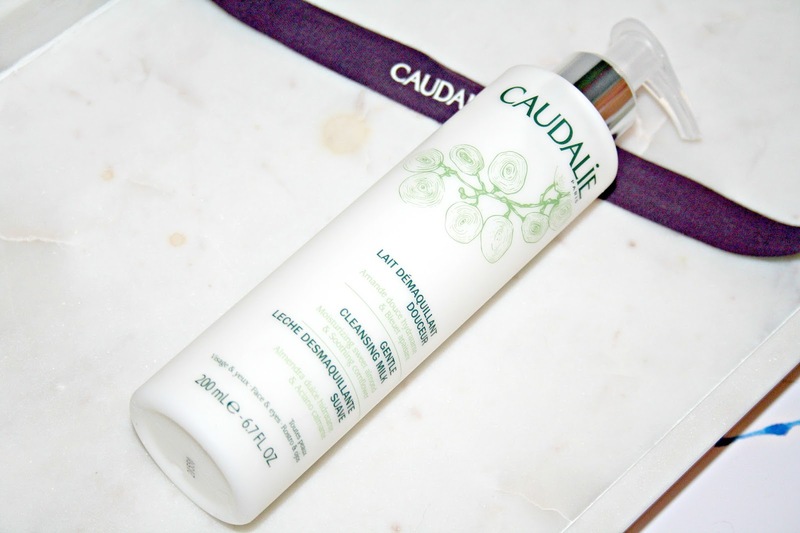 Caudalie Cleansing Milk - If a Micellar Water isn't for you, then Caudalie have a cleansing milk too and whilst it naturally doesn't contain any milk, this has been a delight to use. Perfect for using every day, the texture of this cleansing milk is just so soothing as it is applied to the skin. An almost velvety soft texture which has been designed to again remove make up, dirt, oil and impurities from your pores and because it is formulated for those with normal to dry skin, it is enriched with grape extracts, cornflower and oat extract, all of which work to not only decongest the skin to leave it looking bright but it also works at protecting against free radical damage. For me, I use this as a morning cleanser because I didn't feel it was enough to remove all my makeup if I have a full face. If I am just wearing a non-waterproof mascara and a BB Cream, then I use it in an evening too. I love how my skin feels after using this cleanser and I love how gentle it is on my skin. Priced at £15 for 200ml. 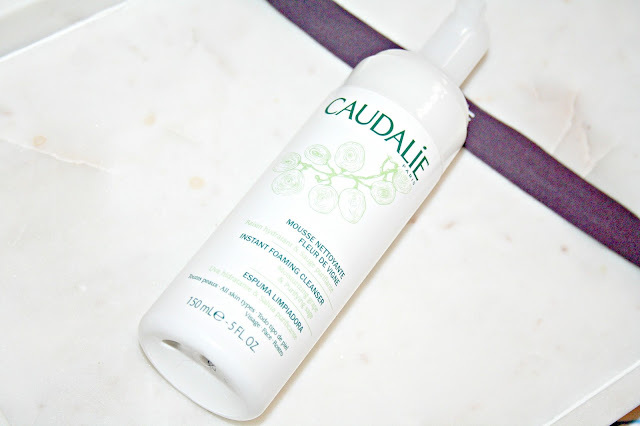 Caudalie Instant Foaming Cleanser - I know a lot of people don't like foaming cleansers, but this one is just divine to use. With a handy pump action spray, when used it does transform into a light and airy foam. I have used a few foaming cleansers in the past and have quite liked how they work, this one is designed to gently yet effectively removes make up, dirt and oil from your skin, for a deep cleansing experience. It is ideal for all skin types, even for those with the most sensitive skin. Enriched with extracts of grape and chamomile which calms and soothes redness, there is also the use of Sage which as an astringent helps to combat oiliness as well as ward off free-radicals. I really like that this cleanser doesn't aggravate my skin and it works perfectly well alongside the Micellar Cleanser water if you are a fan, like me, of double cleansing. Priced at £15 for a 150ml bottle. Makeup Removing Cleanser Oil - I am quite picky with cleansing oils, I really like using them as long as they are not too greasy and don't leave a tacky feeling on the skin. 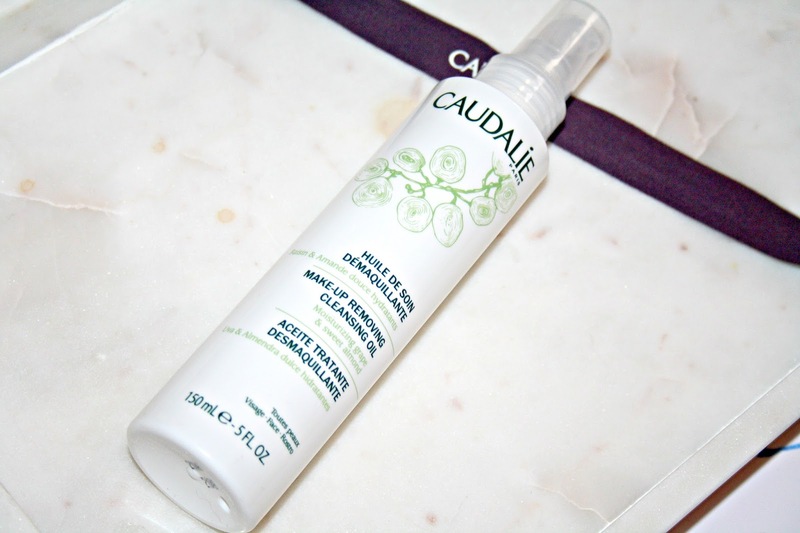 Caudalie formulate their Cleansing oil using 100% natural ingredients which includes both Sunflower and Castor Oil, they come together to dissolve every little bit of makeup on your face as well as any surface dirt and grime. If you love the scent of almonds then you will love this oil. You only need at most 3 drops onto the palm of your hand to gently massage onto your skin and when needed, a few drops of water to emulsify and wipe anyway the excess when you have finished. As expected there is no greasy film on the skin after using and it does remove absolutely everything in its path, even waterproof mascara. Priced at £18 for 150ml. So once the cleansing products have been used, there is a whole host of skincare to discover and again, I am sharing three of the products I was kindly sent. Caudalie Moisturising Toner - Using a toner is something I have done on and off for years. I go through a routine of liking them or hating them. 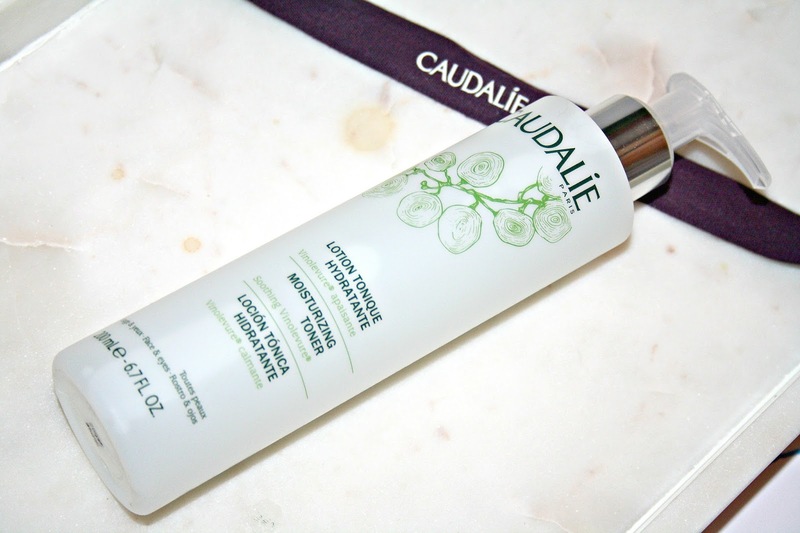 Caudalie's moisturising toner is designed to improve the condition of your skin as well as brighten and boost the effectiveness of your skincare routine. scent of citrus flower, orange tree leaves as well as that of watermelon and crushed mint. Coming together, I find the toner is as soothing as it is moisturising and it completes the cleansing routine you follow really nicely too. At £15 for 200ml, this is a toner I will gladly purchase when I run out. 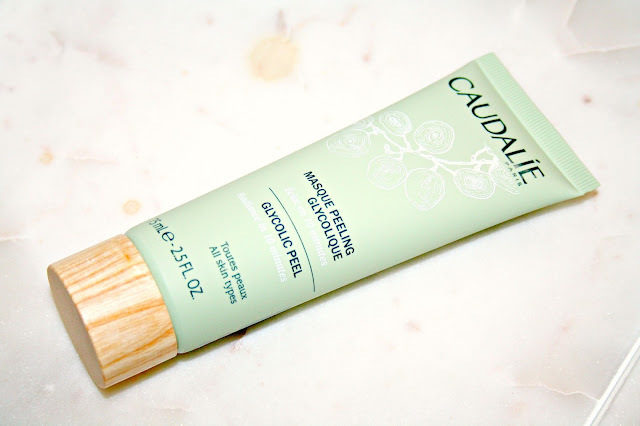 Caudalie Glycolic Peel Mask (£22) - Described as being a gentle resurfacing treatment, this is a mask which exfoliates and refines the skins texture and as you might have guessed, it uses glycolic acid and papaya enzymes to dissolve the bonds which bind dulling dead cells to skin’s surface. The non-irritating formula also uses viniferine, which is packed with antioxidants, to reduce dark spots and improve pigmentation. You only need to use this mask twice a week at the most and in doing so, a thick layer should be applied after cleansing and then left for up to ten minutes before rinsing with warm water, this isn't a mask which dries hard on your skin and because you only need to leave it on for just 10 minutes, it also means it is great for on the go. What I really like about this mask, is that it deals so effectively with the dryness I get on my cheeks thanks to having combination skin. I have found no redness, no irritation and no reaction having used this mask. Priced at £22 for a 75ml tube. 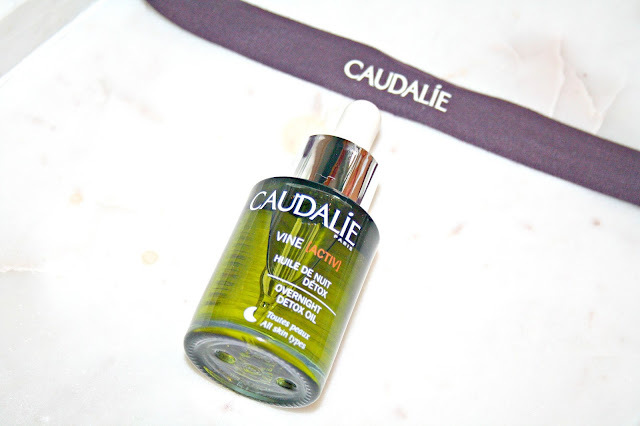 The final product in my Caudalie package is the VineActiv Overnight Detox Oil . Described as being a rich all-natural oil, it is packed full of hydrating and anti-ageing ingredients. I love how lightweight the formula is especially given that it is an oil and it is designed to deeply absorb itself into your skin to enhance what is referred to as your cells’ repair processes so that it can ‘reverse’ the day’s damage. it is not only rich in Omega 6 and Vitamin E but you will also find the essential oils of lavender, neroli, carrot and white sandalwood which come together to regenerate, detoxify, hydrate and soothe the skin as well as to eliminate toxins and speed up cell renewal so you’ll wake up with a glowing, renewed complexion. I love products which can be applied to the skin and left to work their magic overnight, it is almost like having a lazy skincare routine. All you need is between 4 and 6 drops of this oil warmed between the palms of your hands and then massaged onto clean skin. Priced at £30 for 30ml. So, there you have an arsenal of products to Pick n Mix your very own cleansing routine. Whether you have sensitive, dry, combination or even normal skin, there is something for everyone. As for me, I adore the Cleansing Milk and the Oil as well as the Toner and overnight Oil but equally and depending on my mood, I like the Micellar Water used alongside the Instant Foaming Cleanser too. All of these products from Caudalie are available instore and online at places such as Lookfantastic, John Lewis, Feelunique, SpaceNK and Cult Beauty. Have you seen any products you like the look of? I love their Micellar water. It is gentle but it removes makeup super easily and all traces of it. I am so desperate to try out more from Caudalie now, they look incredible, and I love their lipbalm and their hand cream - so good! I usually find foaming cleansers really drying but this one is fab. I am loving the Detox Oil too. I can't say I've ever tried anything from Caudalie before - I think I need to! These products look amazing! I really want to try the overnight detox oil it sounds lovely! My mum uses this brand alot and raves about them, I might have to try some of hers. I really love this foaming cleanser for the morning and agree the oil cleanser is so good at taking off makeup without leaving the skin greasy!